To the contrary, a central point of my position is that Sanders had an advantage over Clinton precisely because he didn't have the baggage of the 30 year smear campaign that Clinton had. Correct. No Whitewater, Vince Foster, Lewinsky*, Benghazi, emails, Pizzagate, etc. The DNC had forgotten in 2008 and 2016 that The Clintons were so toxic that Al Gore lost to W in 2000. Recall that Gore didn't even have Bill stumping for him on the campaign trail. Tens of millions in this country absolutely despise the Clintons, and they especially hate Hillary Clinton. Why? Because this is a country of frickin morons for whom * the poor woman is even vilified because her husband had an affair. It's horrible and it's unfair and I would've been thrilled to have her as my president, but that's where we are in this country. Calling Bernie a socialist? He welcomed that question on the campaign trail. Would he have had some baggage somewhere on which the Russians and their domestic operative, the GOP, could capitalize? I assume so, but nothing like the decades of Hillary-hatred fomented by Faux News and talk radio. What about those blue collar protest and anti-establishment votes that went to Trump in PA, OH, MI, and WI? A lot of those folks would've voted Sanders over Clinton. Enough to beat Trump? Who knows? I never revised history to claim that Sanders would have beaten Trump (we'll never know), I can only share what we know in that he matched up better against him than Clinton did at the end of his campaign. I don't really feel like there's really any point in continuing the debate; we're simply debating opinions on a hypothetical that is impossible to resolve. I suppose the interest in rehashing 2016 is the implication of grave consequences should similar mistakes be made in 2020. Clearly, there's a lot of unresolvable disagreement about what those mistakes were. And yet Clinton won the popular vote. And millions of voters in this country fear/hate socialism with which they paint Sanders as. What about those blue collar protest and anti-establishment votes that went to Trump in PA, OH, MI, and WI? You don't know that Cambridge Analytica wouldn't have used a different strategy. I'm not sure how they mishandled the Elian case given the relatives were hostile. Maybe they did overkill on the military, but that boy belonged with his father. He shouldn't have been made a political pawn. All of the Clinton haters in this thread really need to let it go. Move on. Who are the Clinton haters? I don't hate the Clintons and I enthusiastically supported her in 2016. More relevant might be any Sanders haters lurking about, as that dude actually is campaigning for 2020, and he seems to be doing fairly well. Beware the circular firing squad, the liberal purity tests, etc. If we can simply oust Trump and replace him with a human being who respects the rule of law, that would be a huge step toward healing our once-functioning democracy. I'm talking about the people. What they want. Sure. What the people who own and/or watch Fox News want. That is very relevant to what the Democratic Party should do. Or maybe not. If your opponent tells you that you can win the game by giving them the ball every time you get it, you can try that. You know, we may get a chance to see how this plays out in real time. One candidate can do what his opponents recommend, and the other doesn't. I know which one I think will win. You're assuming that's what the intended result was. Sanders didn't get dragged down by the fallacious questions and went and presented the facts and his policies. He didn't play their game. Sanders outsmarted Fox by allowing them to pack the town hall with his supporters and letting them lob softball questions at him? He is a clever, clever politician! So, I get it, Republican-lite is the safe strategy. Look at how well it worked for the Democrats the last 10 years. How well it worked for McCaskill and Donnelly and Bredesen. I can see why you will have that in a death grip. You certainly don't want people who are unapologetically Democrat. The last 10 years? Are you including both Obama terms and the first 2 years of Dem Congress in those 10? Or is this the cut my nose off to spite my face and elect Trump liberal strategy? I for one would enthusiastically vote Sanders were he Trump's 2020 opponent. That said, I hope he isn't, as he is about the worst candidate that they could select, from his utter lack of Dem support to his sabotage of the Dem party in the 2016 election, to his age, abysmal support of black and other minorities, etc. It is evidence against your claim that "Fox News has consistently framed Sanders as a socialist bogeyman." 1. We are talking about the political climate of 2015-2016, not 2019...as I've already mentioned once. 2. I've admitted I didn't see the town hall, but I dispute the notion that "hosting" Sanders equates to "fawning over" Sanders. Indeed, the notion that such an implication does exist strikes me as patently absurd. While I don't care for Fox News, in my experience they do like to present opposing voices on their shows--Of course, many times that is simply to out shout and belittle them on air. An anecdote: I remember reading somewhere (I think here on this message board) that at the town hall, Bret Baier said words to the effect: Most of you in the audience get your health insurance through your employer. How many of you really want the govt to start handling your insurance? The impression given was that Bret Baier hoped Sanders would be nonplussed by the audience's rejection of national health care, but it backfired on him when Baier was nonplussed by the audience's favorable reaction. Once again, the point being that "hosting" in no way implies "fawning over". You don't rig up favorable coverage for your bogeyman. Fox, and Trump, have consistently shown a desire for Sanders to be Trump's opponent, going back to the 2016 election and continuing today. If Sanders were the bogeyman, or the shoe in that folks here claim, I don't think they would practically be begging to run against him. So? I seem to recall Trump recently tweeted he would be eager to face any of the current crop of Democratic candidates, implying that he would have an easy victory against them. I also remember Trump remarking, in 2016, that he would love to go against "Crazy Bernie"; it would be so easy for Trump to win. Just how is that supposed to be an endorsement of any sort of Bernie? Often, when one candidate wishes to run against another candidate, it's simply because they think it would give them an easy win, not because they approve of the other's policies. Fox and/or Trump expressing a desire for Sanders to win does not equate to endorsing Sanders, nor does it imply that Fox News' presentation of a socialist bogeyman does not exist. Did Fox News try to control the demographics of the town hall audience? Or was it just first come first serve? I have no idea, I'm merely asking. It’s starting to. An analysis of recent polls from November of 2018 to March 2019 shows Sanders is more popular with people of color than white people, and women like Sanders as much as men do, if not more. He leads every other possible 2020 contender with Latino voters and lags behind only Joe Biden — who hasn’t announced a bid yet — with African-American voters. Sanders’ polling numbers with black voters are double that of Sen. Kamala Harris (D-CA), according to a March Morning Consult poll. The claim was never that hosting = fawning over. One can easily host an opponent and shout over them, as you say. This was as far from shouting over or belittling Sanders as we could get, however. The claim was not that they endorsed Sanders. The claim was, as you already pointed out, that Trump and Fox wanted to run against Sanders because they felt that would be an easier win. You may want an easier win for Trump, but I do not. Nonsense. This thread is about the fawning town hall that Fox just gave Sanders. Even Trump was complaining about stacking the crowd to make Sanders look better. This is the antithesis of treating Sanders as a bogeyman. And I've seen no evidence that any favoritism/fawning over Sanders came from Fox News; I've only heard of it coming from the audience. And I've seen no evidence that it was the intention of Fox News to have the audience fawn over him--In fact, my expectation is that it backfired on them. I've seen nothing to indicate I'm wrong about that. I said Fox News and Trump thought he was the more beatable candidate. I didn't say they were correct in that analysis, or that I agreed with them. Sure. What the people who own and/or watch Fox News want. they were all FOX News watchers? Do you have something to support that? That is very relevant to what the Democratic Party should do. Or maybe not. No, what a cross-section of people says. Poll after poll after poll. This is just a punctuation mark on it. If your opponent tells you that you can win the game by giving them the ball every time you get it, you can try that. Or maybe FOX News overestimated just how good their propaganda against Democratic positions was. Losers can keep doing the thing that loses over and over again. Who wins? Or, the more logical and factually supported conclusion: FOX thought they could berate Sanders with their usual nonsense but Sanders didn't take their bait. And the folks they put in the audience liked what they heard. Do you mean when they lost both chambers on Congress? When they lost hundreds of seats at the state and local level? When the Republicans were able to pack the courts with 20-year-old lackeys? Steal an election and 2 Supreme Court seats? Don't give me that "cut your nose to spite your face crap" when you're dunking your head in a deep fryer. The idea of hoping for a terrible to candidate to run against, and even bolstering their chances, so you can beat them really easily, is a terrible strategy (if that is what the Republicans are doing). Two examples in recent history spring to mind - Conservatives in the UK actively called on members to join Labour and vote for Jeremy Corbyn. Although he is not Prime Minister his party ate into the Conservative majority and ended up making them have to create a shaky coalition that has kept them mired in the Brexit mess. And the other example is in the Us where some people thought it would be a hilarious wheeze to run against some orange clown in order to usher in easiest presidential victory in living memory. Of course, it didn’t work out that way. So if Fox News think that boosting Sanders is a good idea because they have some foolproof playbook to use against him then they might rue the day...! Do I something to support that the people watching Fox News were watching Fox News? Dems should certainly favor what a cross section of people and various polls want. Of course! But Dems should give little to no credence of what Fox News is telling them people want. I don't think they overestimated how well their propaganda would affect some, that's certainly true. But Fox packing the audience with pro-Sanders people (according to Trump at least) doesn't indicate what you think it does. Why would Fox be surprised when their hand-picked audience reacts exactly as they were expected to? I think if you keep doing what your opponent wants you to, your opponent will win. You are, of course free to keep doing what your opponent wants. Do you have any examples of Fox berating Sanders in this town hall? And of course the hand-picked audience liked what they heard. That's why Fox picked them, to make a weak candidate look better and more popular. Ok, don't cut your nose off to spite your face while dunking your head in a deep fryer. Refusing to vote for Clinton got Sanders supporters these packed courts and stolen Supreme Court seats. You really ought to research what Trump was actually saying about Sanders in the 2016 election. What you wrote has no relationship to it, and what he said was entirely favorable rather than demonizing him. Other than the claims of Fox packing the audience with pro-Sanders people? You may not agree with them, but you are certainly supporting their goals. You really ought to research what Trump was actually saying about Sanders in the 2016 election. . . . what he said was entirely favorable rather than demonizing him. Correct. Trump understood that both he and Sanders were competing for a lot of the same disaffected, entirely-fed-up-with-the-party-establishment people. With Bernie out of the picture, the DNC assumed Clinton would get all his supporters because they had anointed her president-elect in 2008 – classic blinded-by-the-bubble thinking. Instead, a lot of the Bernie supporters were *never* going to vote for Clinton. Some of those fools went for Stein, some for Johnson, and a lot of them stayed home. But a bunch of them also voted for Trump. Trump knew that he could skim Sanders' supporters through little more than his continued vilification of Clinton, but he was also shrewd enough to compliment those people by drawing parallels between his approach and Sanders'. Why should I? I lived it. I remember it. "Crazy Bernie"...remember that? However, just to humor you, I Googled: what did trump say about bernie in 2016. Speaking in Cleveland, Ohio, on Saturday, Donald Trump calls Democratic presidential candidate Bernie Sanders a communist and says Sanders supporters are ‘troublemakers’. DONALD TRUMP: My people are nice. The people that came there were so nice. And let me tell you, the people that were there, that came there, that were invited there, thousands and thousands of people, they caused no problem. They were taunted. They were harassed by these other people. These other people, by the way, some represented Bernie, our Communist friend. Donald Trump tore into Sen. Bernie Sanders at an event in Council Bluff, Iowa on Wednesday, saying that he "would have been legendary" if he hadn't sold out to Hillary Clinton. Sanders appeared with Clinton earlier the same day to endorse her debt-free tuition plan. "And that's when I said the system was rigged," Trump said about the Louisiana Republican primary. "And Bernie Sanders had the rigged delegates, and Bernie Sanders had the rigged DNC. The rigged, do you remember? Deborah Wasserman Schultz." "I don't know how Bernie Sanders can be on the side of Hillary Clinton when the DNC-- the Democratic National Committee-- run by Hillary Clinton's person Deborah Wasserman Schultz," he said. "What they did to Bernie Sanders was unbelievable. And now he's supporting her." "Though I think the Bernie Sanders people are supporting us," Trump said. "Because I'm much better on trade than Bernie Sanders even was, and he was okay. But he's supporting her." Now, do I think Bernie was demonized as much as Hillary? Of course not. But Trump's and Fox News' portrayal of him wasn't "entirely favorable" as you claim, either. Oh, you mean this "claim"??? Enough said on that one, I should think. 1. Just because he thinks it will benefit him does not guarantee it will benefit him. It may backfire on him. 2. You may find the story of Br’er Rabbit and the briar patch illuminating. It's a mistake to believe your opponent is always being sincere. I'm pretty sure we have plenty of other threads talking about 2016. Back to the here and now: What does Sanders' reception at that town hall mean for other Democratic candidates? Is it possible that the positive reception that an allegedly mixed crowd gave to the policies he spoke about (like Medicare For All) makes it "safer" for the other candidates to push further left? I think it shows that there is a broader, non-partisan appeal to a populist economic policy. Previous mainstream democrats have tried to distinguish themselves largely on cultural and social issues while remaining largely silent on broader economic issues. I think Bernie shows that people are much more motivated by ideas of economic prosperity for the masses than they are by moral righteousness. Civil rights should be part of any Democratic platform, but Bernie shows that economic inequality should be the tip of the spear. Bernie is going to make it very difficult for Neoliberals to gain wider traction, as they neither appeal to the right or the progressive left. A democratic candidate that is too timid on these issues will probably have a more difficult time in front of a conservative audience than a more openly progressive one. Last edited by SuburbanTurkey; Yesterday at 05:36 AM. They didn't specifically look for FOX News watchers. and even if they were,don't you find it interesting that they produced that response? Or are you saying the entire audience was actors? Dems should certainly favor what a cross section of people and various polls want. Of course! provided they all want big donors and establishment picks. But Dems should give little to no credence of what Fox News is telling them people want. I don't think they overestimated how well their propaganda would affect some, that's certainly true. We are talking Trump at his word? Really? That is what you want to go with? doesn't indicate what you think it does. Why would Fox be surprised when their hand-picked audience reacts exactly as they were expected to? And you're assuming FOX wants people to like Democratic policies. Do you have any examples of Fox berating Sanders in this town hall? Other than the nonsense about his personal finances and the abortion question? And of course the hand-picked audience liked what they heard. That's why Fox picked them, to make a weak candidate look better and more popular. He would only look better to Establishment members of the Cult of the Middle. And they ain't going to support him, so what would be the point? Getting an audience live on FOX News to cheer for "socialist" ideas makes those ideas more palatable to folks watching FOX News. Even if Sanders doesn't go much farther, candidates like Warren can keep pushing the ideas and the establishment candidates might have to try appealing to the majority instead of just the big donors. Nope. Not re-litigating 2016, not matter how many debunked myths your spout. No matter how maddeningly obvious it is so many Democrats didn't learn a damn thing from it. This is so very, very true. It's even more maddening that those who didn't learn from it can't even see what they did wrong and are doing wrong again. Ya, like, ignore what people want in favor of the establishment and their fanboys. It doesn't matter how many millions a donor gives, it is still just one vote. And most of the big donors are giving to both sides anyway. And still not doing anything about sweeping voter suppression. Do establishment democrats even understand you need votes to win an election? This actually appears to be a problem for the far left wing. You cannot win an election by counting on only the extreme portion of the party. Attempting to insult and alienate the majority of the party will only get you 4 more years of Trump. There is no silent lost tribe of far left voters. 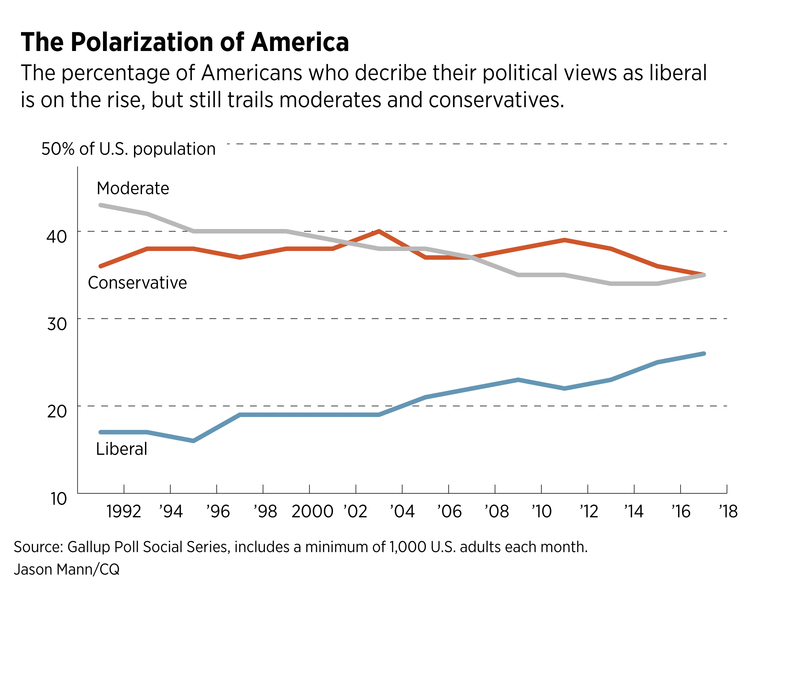 The trend has been towards democrats becoming more liberal but moderates still are the majority. A Recent Poll showed that 54% of democrats want a more moderate party, 41% more liberal, and 5% not sure. However, the real question is whether those who prefer a more moderate party would still show up to vote even if a more liberal candidate were nominated. This is just my opinion but I think they would. I'd bet that the more moderate voters are more likely to show up and vote for a liberal democrat than the more liberal voters are to show up and vote for a moderate democrat. The poll didn't ask about the age of the participants but I'd guess that as the age of the participant increased the higher the preference for a more moderate democratic party. We've seen that the younger generation has a higher preference for more liberal candidates and they are also the harder group to get to vote. Will they be excited enough about a candidate like Biden to go vote? I doubt it. Meanwhile Republicans want their party to become more conservative than more moderate by 57-37. So we'll probably end up with another lackluster moderate democrat like Biden (aka republican-lite according to the rest of the western worlds political spectrum) who will either lose again to Trump or win but retain the status quo and continue trying to find the middle and compromise with Republicans. I think you overestimate how many people are in your "what the people want" and underestimate how many people are in "the establishment". Yes, after the election turns out they can't do what they promised, including Sanders. But this is about votes for the candidate. Last edited by Skeptic Ginger; Yesterday at 08:28 PM.